Before the landscape is fully awash in autumn hues, Mother Nature offers a beautifully blended palette of brilliant warm-weather colors and cool, rich jewel tones. Inspired by this striking combination, stylist Tracey Runnion created a collection of brilliant blooms and elegant foliage. Crisp white anemones stand out against a background of ‘Black Beauty’ begonia leaves, Black Beauty tea roses, and mini green hydrangeas. 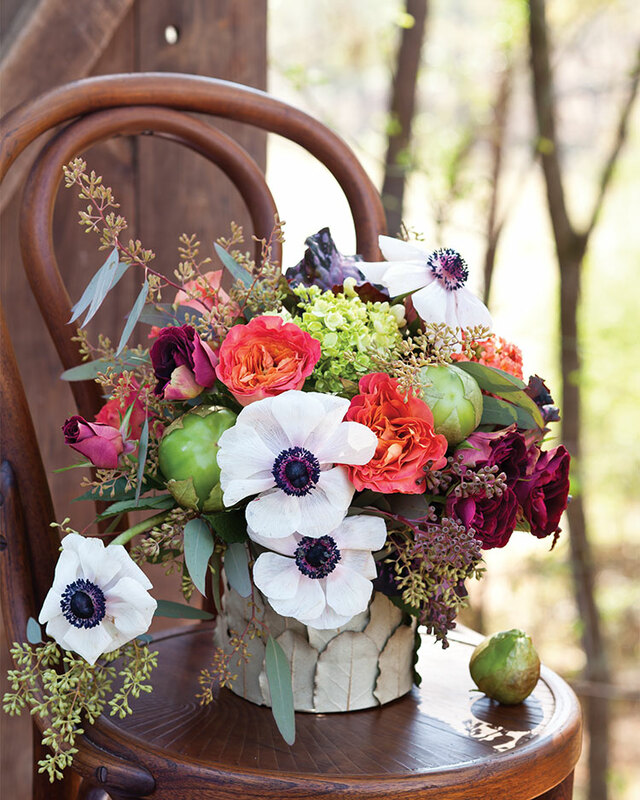 Punches of peach and orange are sprinkled throughout with the use of garden roses and Kalanchoe. Seeded eucalyptus adds texture to the arrangement, while tomatillos speak to the days of harvest soon to come. Use the natural silvery tones on the back of Elaeagnus leaves to enhance your arrangement with a custom leaf-clad vase. 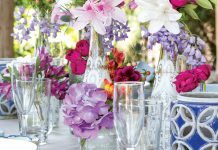 Measure the height and circumference of your vase, and cut out a rectangular piece of card stock with these dimensions. 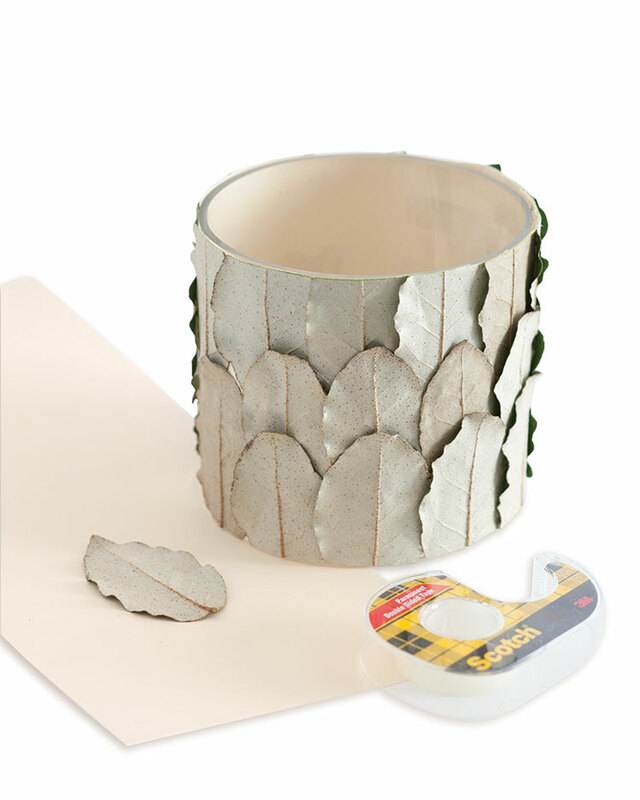 Use double-sided tape to attach Elaeagnus leaves, backs facing out, to the card stock, overlapping as you go. Once you have covered the card stock, trim any overhanging bits. 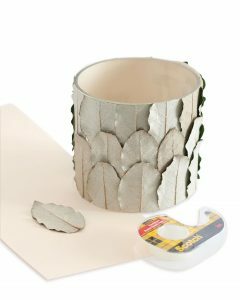 Wrap the card stock around your vase, and secure it with double-sided tape. 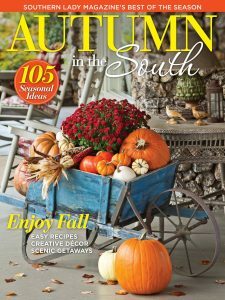 Don’t forget to pick up a copy of Autumn in the South for even more autumnal splendor! 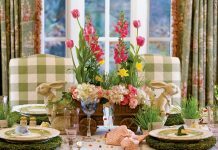 This special issue includes seasonal décor, beautiful table settings, and a lineup of delicious recipes.